By Nels Dzyre in Mobile. Updated on November 18, 2017 . We do so much on our phones that multitasking across multiple apps becomes a must. Whether it is switching from one app to another, or accessing Android settings quickly and painlessly, if you do it often enough, you will learn to appreciate shortcuts. Even the latest iOS offering by Apple has introduced faster access (swipe up) to settings, straight from the homescreen. Of course most of you would be able to long-press on the Home button to pull up a list of recently used apps but to make the most of it, you probably need an app that lets you switch between apps seamlessly. In this post, we’ve pulled together a mini-compilation of free and cool Android multitasking apps to help you reach your favourite apps, shortcuts, settings or even organize your apps quite easily. Swipe in sidebars, cut pies, notification bars, and even an interface that resembles the Mac Dock with these multitasking apps. Next thing you know, you’ll be wondering how you ever functioned all this while without one. Swapps will appear at the side of your screen through a swipe from the edge, showing your most recently opened apps. Nothing special there, however Swapps also lets you customize the swipe area by size and also lets you mark special apps (starred) to keep them at the top of the pile all the time. 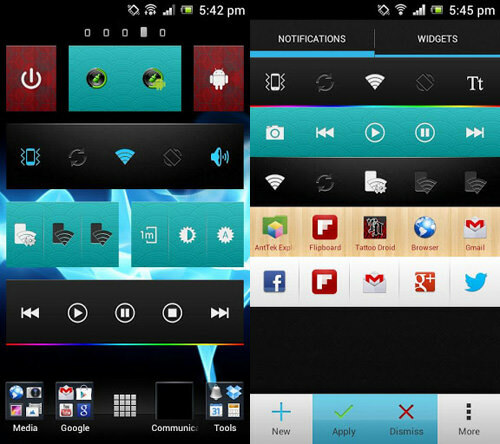 The notification bar can also be made see-through so it won’t cover your line of sight. 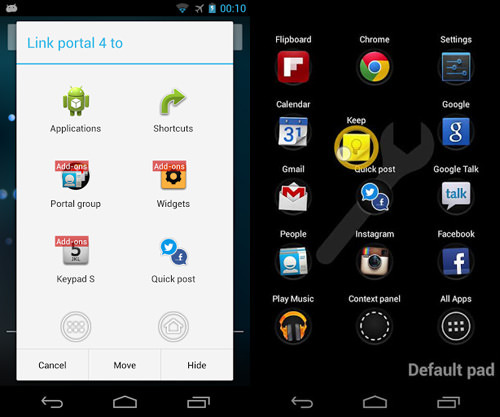 With a drag of the finger from the edge of your screen, you can pull up a pad of your favorite apps. 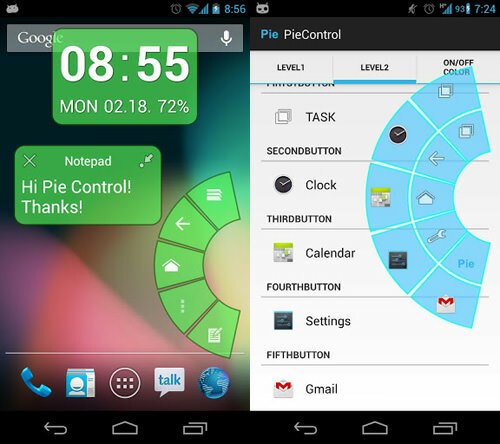 SwipePad, or Hyperspace Launcher allows you to pull up not only your favorite apps but also bookmarks, shortcuts, contacts and even widgets all from within your very own custom pad. It’s also battery- and RAM-friendly. 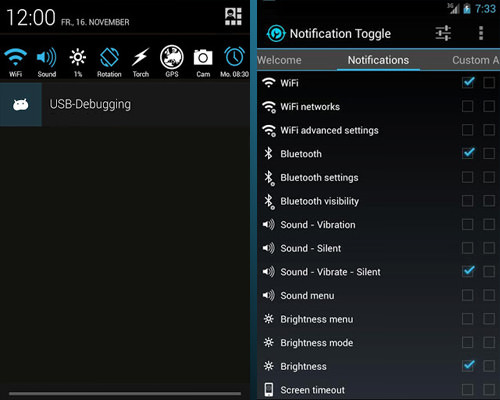 Here’s a notifcation bar editor, known as Notification Toggle. By selecting settings you want to put into the notification bar, you can skip going back to the homescreen and access your settings straight from a notification pull out. 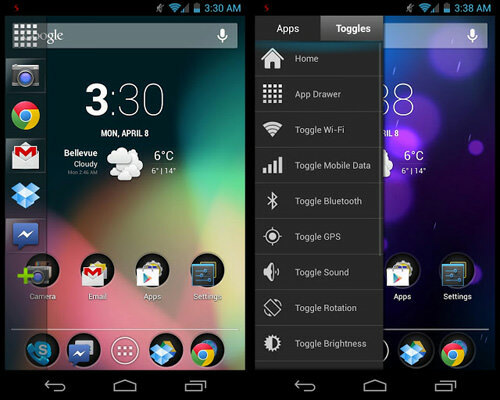 You can also add apps of your choice into the notification bar too. Your notification drop-down bar can actually allow you to do more than just change your Android settings. With 1Tap QuickBar app, you can add app shortcuts, direct-call someone, launch a browser, and have fast access to your media (plus 50+ more built in tasks) to the task bar and run them with just 1 tap. You can also customize the quick bar in terms of text, background and colors. Here’s another one that functions in a mini sidebar, giving you easy access to your apps (5 spots in free version, 10 spots in Pro version) or customized tasks (direct-call). 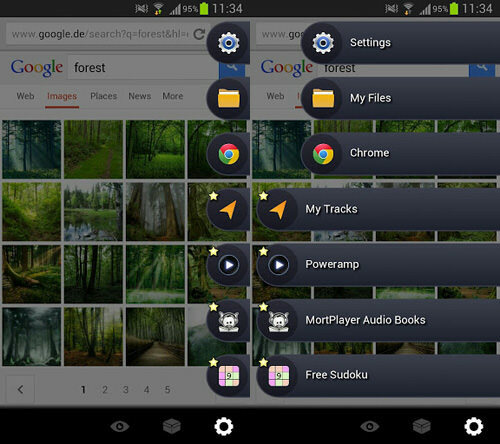 It also helps you organize your apps according to labels, manage and uninstall them quickly (with long touch). Press the Home button once to run HomeFlip and press it again to return to your home screen. Alternatively, you can also activate it via swiping gestures. You have the option to list your favourite apps or recent ones, as well as get support for themes and custom fonts, all without having to view ads. Don’t want to overwork your Home button? You can use a floating icon to access this app switcher instead. From there, access your favorite apps or recently used apps. To kill an app, just long press the app. 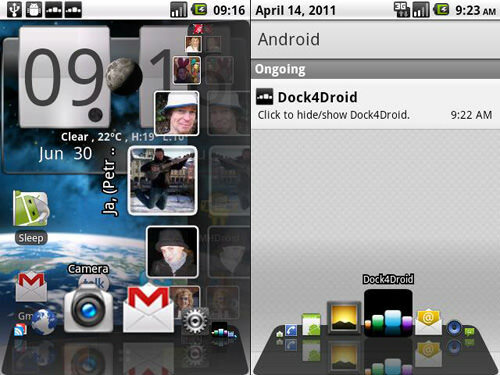 Dock4Droid is quite similar to Swapps but will probably remind you more of the Mac dock. Activate it from the side of your screen to get to your app list, contacts and shortcuts. It is fast and beautifully rendered to a degree, making it easier for you to multitask at ease. You can pay to unlock the app and get more than 4 slots for your apps and shortcuts. For those who have rooted their Android and installed a custom ROM from the Paranoid Android team, you might know about their ‘PIE’ feature. Well, it’s now available for everyone at the Play Store, even if you are not using their ROMs. Drag it in from the edge of the screen to start it up and you will see a cut-pie view of apps, tasks or tools you can launch right away. 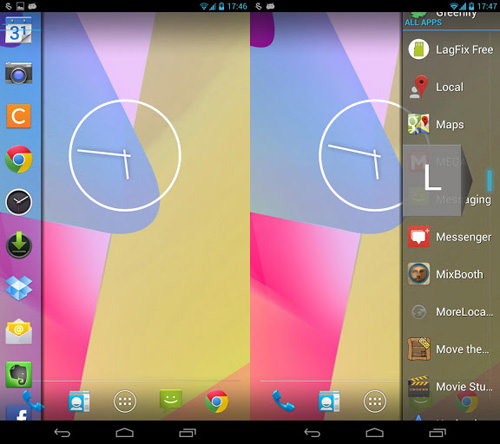 Sidebar is a fast, fluid and customizable overlay for the Android screen. 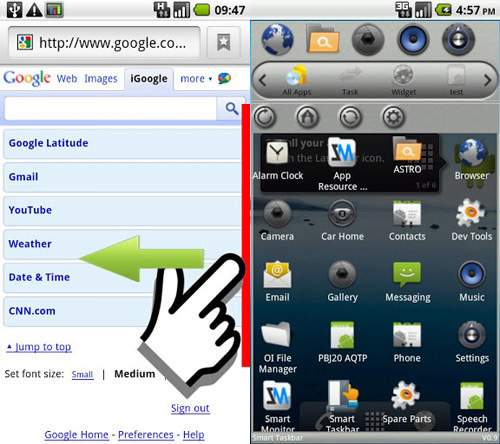 It brings up your favourite apps and your Android settings with just a swipe on the left of your screen. It has minimal effect on battery life and also consumes only a small part of RAM usage as well. You can choose to enable it on boot. 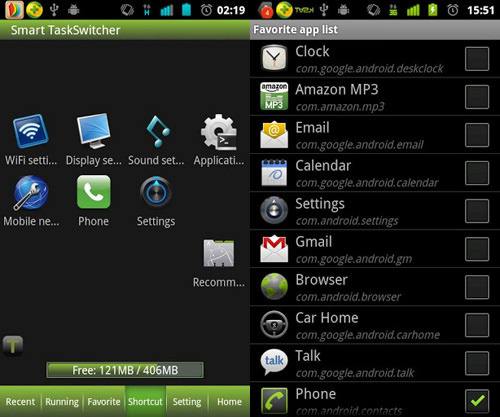 Know of any multitasking apps you want to introduce to everyone? Let us know in the comments.